RE: Protest of the Proposed December 2018 oil and gas Lease Sales by the BLM Rio Puerco Field, Farmington District, and Pecos District Offices. I protest the lease sale of 113 nominated parcels of public lands in New Mexico managed by the Bureau of Land Management (BLM) at the December 2018 lease sale. The Farmington Field Office Resource Management Plan amendment and the Rio Puerco Resource Management Plan revision processes are still ongoing. A full analysis of the impacts of horizontal drilling and multistage hydraulic fracturing has yet to be addressed. Interior Secretary Zinke deferred the March 2018 lease sale calling for more cultural consultation and admitted that the Greater Chaco region needs more cultural study. But the BLM has made no attempt to survey over 5,400 cultural resources in the region. Therefore, the BLM is violating the National Environmental Protection Act and the National Historic Preservation Act and is breaking its commitment to consult with tribal governments and impacted communities before these areas are offered for lease. People living in the Greater Chaco region are suffering the impacts of oil and gas exploration, including increased levels of asthma and cancer, air contamination, unsafe traveling conditions, dust pollution, and the desecration of sacred landscapes. The Navajo Nation, All Pueblo Council of Governors, New Mexico Congressional delegation, New Mexico state legislature, and many NGOs and concerned citizens have called for a moratorium on all new leasing until the BLM has completed management plans that address the impacts of horizontal drilling and fracking. Furthermore, oil and gas companies in the Permian Basin are completing wells at an astounding rate. Now, the BLM is developing a new plan that would open up 97% of all public lands in this area for oil and gas development. Even worse, up to 50,000 acres of public lands would be sold and privatized. By going forward with this lease sale, the BLM is failing in its obligation to fulfill the agency’s multiple-use mandate. Over 91% of public lands in the San Juan Basin are already leased for oil and gas, and the Permian Basin is already experiencing the negative consequences of intensive oil and gas extraction. Please cancel the December 2018 lease sale for the listed parcels included in the letter. We believe that every New Mexican regardless of race, ethnicity, or class has a right to be properly informed and engaged in the decisions regarding our land, our communities, and the future development from economic development to community development. The struggle for land rights continues for Native American, traditional Hispanic and low -income communities. The current lease sales will bring disparate and disproportional impacts upon the communities with the slated oil and gas lease sales. This is not only troubling; it is an indication of systemic bias bent on industry-mandated extractions. It would not be hard to lodge a federal complaint to address a decades-old systemic discrimination, where more affluent communities are protected and low-income minority communities are left out of the process, or not allowed public hearings or comments through private ordinance jurisdictions further disenfranchising minority and low-income communities. How jurisdictional multi-level government and the oil and gas industry make a decision without stakeholder’s participation in putting profit over people and our land. Transparency and accountability are foremost in any good functioning government. Governments must actively account for all their actions and take public responsibility for their actions and decisions. Practices and policies are designed to encourage collaboration and co-creation at all stages of the process. This is what good government looks like. There is attention to diversity and inclusion. Women, the disabled, minorities and/or vulnerable are included. Attention includes the use of appropriate languages, technologies, and methodologies to include minorities. In accordance with Title VI of the Civil Rights Act of 1964, each Federal agency shall ensure that all programs or activities receiving Federal financial assistance that affects human health or the environment do not directly, or through contractual or other arrangements, use criteria, methods, or practices that discriminate on the basis of race, color, or national origin. Any Federal and State funding may be jeopardized by the continued disproportionate and disparate impacts. BLM approval of lease sales holds the federal government responsible for civil rights violations. The federal government is not ensuring against the high adverse human health and environmental effects on minority and low-income populations without implementing a full EIS and/or RMP. Title VI of the Civil Rights Act prohibits recipients of federal financial assistance (states, grantees, etc.) from discriminating based on race, color, or national origin in any program or activity. Executive Order 12898, on the other hand, directs federal agencies to identify and address, as appropriate, disproportionally high adverse human health and environmental effects of their programs, policies, and activities on minority populations and low-income populations. However, a Title VI civil rights complaint may raise environmental justice issues when challenging a recipient’s activity. For instance, if a state agency receives funds from EPA to run a clean air program, that state recipient is legally prohibited from discriminating on the basis of race, color or national origin under Title VI when engaging in clean air enforcement activities. The EPA, in complying with Executive Order 12898, can also ensure the programs it funds consider disproportionately high adverse human health and environmental effects on minority and low-income populations. This includes the BLM’s consideration of land use protections for health and safety and best practices. The follow-up actions by BLM to continue the RMP is better placed, and not ignore the RMP and NEPA process. BLM is seen bulldozing the lease sales over the objections of the minority and low-income communities being impacted. These complaints are troubling. BLM apparently has ignored the health and safety concerns voiced by Tri-Chapter tribal leaders and those living on tribal trust lands and private lands in the current impacted areas. These lack of actions indicate a deep bias against Indigenous and Hispanic communities because their concerns are dismissed and BLM proceeded with Lease sales without following NEPA regulations and whittling away public participation with shorter comment periods, Fewer public meetings. Lost comments. Federal agencies are making it more difficult for citizens to weigh in on environmental rules and actions and are seen as a ‘pattern and practice’. Public Participation and Notification The current policy change is not allowing the many minority communities and hundreds of residents, many low-income, the information of the intended sales and the impacts on their property values, health and safety. Public comment shortened from 30 days to 10 days does not allow enough time for a response for working residents to attend informational meetings and respond in the shortened timeframe. Will further exacerbate effectual communications due to language barriers that require multiple conferences to ensure that the information is understood and minority and low-income members are able to express concerns to be addressed. Further, disallows members of the public the opportunity for redress in the Notice of intent (NOI) or in the NEPA process further along in the RMP or EIS process as stakeholders. Clearly, under the administrative law, the federal agency is required to follow NEPA, Required to give a 45-day comment period, provide information to a community without Broadband Technology in hard copy form. BLM’s duty under the law is to communicate and include the emergency response plan, fire, and road safety requirements, and the healthcare impacts of sitting heavy toxic polluting industry on 50,000 parcels that will contain migrating pollution. BLM Santa Fe office including Farmington and the Rio Puerco offices know full well they are practicing environmental racism without adequate notification (a 10-day commenting period) prior to completing the RMP or EIS federal process. To allow this BLM must not care to understand the ramifications that there appears to be a violation of civil rights and basic human rights. BLM is obviously out of touch with the reality and gravity of the federal complaint regarding a history of discriminatory practices and violations of the Civil Rights of Hispanics, Chicanos, Native, and African Americans in New Mexico. LACK OF A HYDROLOGIC STUDY BY THE BLM– the Bureau of Land Management has not completed an independent and official study of the underground water flow and the surface water pathways, into the Rio Chama Watershed, in the proposed lease sale area near the Continental Divide and the community of Lybrook (PARCEL #71). There is a blatant failure by the BLM to delineate, or portray precisely the Eastern San Juan Basin’s complex hydrology. This area is on the southeastern edge of the San Juan Basin and is adjacent to, or part of, a strong geological uplift area that is characterized by complex folded layers known as the Nacimiento Uplift. BLM has not included watersheds surface and groundwater flora and fauna impacted, in the Lower Colorado (Watershed Yellow area in NW corner map (above) of Sandoval County), Espanola Basin Sole Source Aquifer Designation, the Rio Grande AKA Santa Fe Sub Basin Group, and San Juan Basin. All comingling of the waters between surface and groundwater should be taken into account since there is reliance on groundwater for drinking water source in nearly 80 % of New Mexico. These considerations are paramount in the RMP along with a full EIS of the area, The poisoning of drinking water resources and supplies by the extensive fracking and drilling outside the geological boundary of the San Juan Basin is most likely to destroy groundwater sources. Both hydrological and geological studies should be made public and evaluated in the RMP before approving and launching online lease sales when they will not accept online public comments. The BLM 2003 Plan and associated Reasonably Foreseeable Development Plan, DOES NOT ADDRESS FRACKING IN THE MANCOS SHALE, A LAYER FROM 0-5000 FEET BELOW THE SURFACE, SOME OF WHICH OVERLIES GROUNDWATER. THIS IS NOT CONSIDERED A PREFERRED OR NECESSARILY SAFE GEOLOGIC STRUCTURE TYPE FOR FRACKING. The BLM has an internal administrative policy that allows this use of outdated documents until a new one is prepared. What about the option of a deferral of drilling until the 2003 Resource Management Plan is properly updated? CHEMICALS– many chemicals are used in fracking; some known, some not – most are toxic or can be radioactive at low levels. Radium found naturally in lower rock levels would be contained in rocks, even if brought to the surface. However, Radium turns in a radioactive gas called Radon, and that will be dispersed into the air. The Brine water will also contribute to a larger waste stream within the Region that is radioactive agents of uranium and full of lead, arsenic and other heavy metals and minerals and VOCs. This is another waste stream additional to the fracking operations that will impact the region with the use of Sandoval County Raw Brine and injection of highly radioactive produced water. BLM should take seriously the comments on the RMP tests, survey results, and statements by Tri-Chapter leaders regarding the health and safety impacts experienced by many residents who live on trust lands and private lands. We have not seen any public statement on what the BLM intends to consider regarding the Tri-Chapter complaint. The BLM also will need to consider the migrating pollution plumes of air and water on other jurisdictions. This outreach is crucial to a collaborative citizen engagement, which is key to good public administration. SEISMIC ACTIVITY– Has not been sufficiently considered in the Watersheds impacted, not in the Lower Colorado Watershed, Espanola Basin Sole Source Aquifer Designation, the Rio Grande AKA Santa Fe Sub Basin Group, and San Juan Basin where there are several known fault lines near our water sources and in the geological formation of the Rio Grande (Nacimiento) Rift. Injection wells are often used to dispose of wastewater and these are known to cause seismic activity. There is also increasing evidence in New Mexico, Texas and Oklahoma that fracking is associated with significantly more earthquakes. AIR QUALITY AND CLIMATE CHANGE– Flaring is a common practice used in fracking in which huge amounts of hydrocarbons are released directly into the atmosphere. A 3- 12 miles radius near flaring pits has been identified as dangerous to human and animal health. In 2014, scientists working on a NASA study discovered a 2,500-square-mile cloud of methane hovering over the Four Corners region. The BLM seems to dismiss this as being of unknown origin, although recent studies clearly indicate that oil and gas development is the largest source of emissions contributing to this massive methane “hotspot”. Environmental health studies have found impacts of respiratory illnesses up to 10 miles from fracking wells, according to the peer-reviewed studies by Physicians for Social Responsibility. The Federal Land Policy and Management Act of 1976 (“FLPMA”) directs the Secretary of the United States DOI, through BLM, to “manage the public lands under principles of multiple use and sustained yield.” 43 U.S.C. § 1732(a). BLM accomplishes this directive by developing, maintaining, and revising RMPs. 43 U.S.C. § 1712(a); 43 C.F.R. § 1601.0–5(n). RMPs “guide and control future management actions.” 43 C.F.R. § 1601.0–2. RMPs establish “[l]and areas for limited, restricted or exclusive use” and determine “[a]llowable resource uses (either singly or in combination) and related levels of production or use to be maintained.” 43 C.F.R. § 1601.0-5(n)(1)–(2). cooperation in the RMP process by inviting relevant state and local governments and federally recognized Indian tribes to participate as “cooperating agencies.” 43 C.F.R. § 1610.3–1(b). BLM provides cooperating agencies with “opportunity for review, advice, and suggestion on issues and topics that may affect or influence other agency or other government programs.” 43 C.F.R. § 1610.3–1(c). The BLM, in the entirety of the 50,000 + parcels is REQUIRED TO DO AN RMP/EIS. We request that the RMP/EIS cover every Lease Sale that the BLM has scheduled in its entirety before conducting the any online or “in-person” lease sales in December 2018 and beyond. SOIL RESOURCES– in this high desert climate, the soil can be fragile. Our concerns for the soil in light of heavy traffic from big rigs used in fracking; the traffic and erosion caused by roads and construction of drilling pads; toxic chemical spills and the hauling of water have caused in other counties in the nations that have similar populations. The EPA and State authorities state that in some areas soils are fragile, but this is of “minor concern due to the remoteness of parcels”. In other words, out-of-sight is out-of-mind, if they can’t see it, it doesn’t matter. Surely, this is not the message the BLM wants to be sending. Wastewater pits, with indeterminate lining, are another means of disposing of fracking’s toxic sludge. 1.) What are the provisions to keep birds and animals from drinking, or landing in, the open pit storage water? 2.) What assurance that each parcel application has been inspected for threatened and Endangered Species? DARK SKY–NOISE. The BLM has not inserted from the hours of previous comments, the protection of the night sky and protection from noise in rural settings and is a taking of property values that impact health and safety of its citizens. CULTURAL RESOURCES AND LANDSCAPES of Indigenous Nations and Tribal Communities are not being appropriately addressed. Here is a map of Wells in question that has not been adequately addressed that are in violation of the buffer zone. 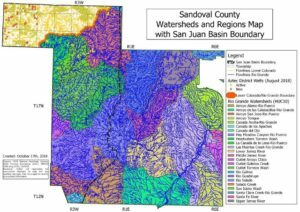 Those wells that breach of the buffer zone should be included in an expanded boundary to include the watershed and boundary edge of the SE San Juan Basin of the Lower Colorado. Our suggestion is to enter into a formal collaboration with tribal communities on trust lands and those on private lands being impacted by the BLM decision. Mediation on collaboration is needed because the BLM actions have shown its inability to address the process adequately. 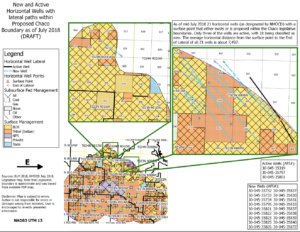 LOW SOCIOECONOMIC POTENTIAL FROM OIL AND GAS– The BLM’s assumption if there is a “No Action Alternative” (no lease option) in the environs of impacted watersheds. IN OTHER WORDS, IF THERE IS NOT ENOUGH OIL AND GAS TO BE OF ANY REAL COMMERCIAL VALUE, then why move forward without a socio-economic cost-benefit analysis or fiscal impact analysis. The BLM barreling towards oil and gas exploration at grave risks of chemical and mechanical pollution without proper notification and not allowing a longer time for public comments exposes a corrupt closed process that will rubber stamp oil and gas production with FONSI’s. The INFRASTRUCTURE required for oil and gas production has not been addressed nor has its impacts on the environment including pipelines, compressor stations and gathering lines. The systemic segregation of a seating of heavy industry in places of pristine wilderness and rural minority communities without a master plan oversight of over 50,000 oil and gas parcels; sets to deceive the public on the scope of the heavy industrial onslaught that BLM is set to approve without giving our communities the right to be properly informed and engaged in the decisions regarding our land, our communities, and the future development from economic development to community development. The struggle for land rights continues for Native American, traditional Hispanic and low -income communities. The costs of inspections, mitigation, and cleanup including road repair always fall on the taxpayers. BLM has not informed the public of what costs will burden them when there are not enough inspectors on the current operating and abandon wells. Currently, a well is inspected once in 5 years. Many of the inspection reports have shown that the inspectors could not have inspected the number of wells in a day they say they had due to time, distance, and issues reported. No requirement for additional air monitoring of schools inside and outside air quality. No Real-time air monitoring for oil and gas particulates including FLIR Cameras to report real-time emission violations on fracking rigs. HEALTH CONCERNS–According to peer-reviewed studies, (already submitted previously to the BLM), respiratory illnesses from fracking operations healthcare costs would soar upwards to $275,000 a day. Are the BLM administrators aware of types of illnesses that are currently being experienced and the impact on the minority community in order to address these health issues? BLM’s definition of “environmental justice refers to the fair treatment and meaningful involvement of people of all races, cultures, and incomes, with respect to the development, implementation, and enforcement of environmental laws, regulations, programs, and policies. It focuses on environmental hazards and human health to avoid disproportionately high and adverse human health of environmental effects on minority and low-income populations.” BLM appears to violate their own regulations through an insider policy decision that are driven by the current administration’ s disregard for the rule of law, and its a racist implementation of a policy that disproportionately impacts economics, the health and safety of the communities adjacent to and in the parcels being sold. These are regional impacts. How does BLM plan to address these issues after they commit genocide and ecocide by their decisions? The observations of citizens regarding the BLM’s disregard for environmental justice issues and the lack of appropriate action to wait for NEPA and the RMP only adds to the disdain for the government of an agency that is supposed to protect the land, water, air, and uphold the public health and safety. Instead, BLM is implementing a policy of genocide and amount of over 50,000 parcels of lease sales slated surmounts to a crime against humanity. Additionally, there has been no concern for the emissions that are drivers for climate change that these lease sales would impact in light of the recently released IPCC report. Please defer any lease sale until the RMP and EIS are complete and BLM has fully addressed the concerns with a formal Environmental justice investigation regarding the disparate impact of the seating of the heavy industry expansion in the region.